The combined Likud Beytenu party keeps dropping, getting just 33 seats in the latest poll. Yesh Atid, Movement both rise. The Likud Beytenu party continued to drop in the polls Friday. A survey published by the Hebrew-language daily Yediot Aharonot showed the front-running party getting just 33 seats. The party was formed by a merger between Likud and Yisrael Beytenu, which have 27 and 15 seats in the current Knesset, respectively. The poll showed Labor in second place with 17 seats and Habayit Heyehudi (Jewish Home) in third with 12. Shas, Hatnua (Movement), and Yesh Atid followed with 11 seats each. Political expert Professor Asher Cohen warned Tuesday that the Likud Beytenu merger was a mistake that will cause the parties to lose support to the Jewish Home party. Likud's decision to focus criticism on Jewish Home head Naftali Bennett this week just made things worse, he said. 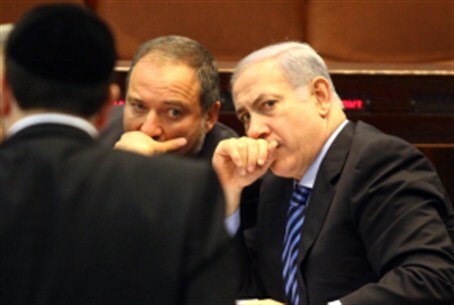 Likud higher-ups also criticized another coalition party, Shas, with Prime Minister Binyamin Netanyahu (Likud) stating that Likud would take over the Housing Ministry, currently in Shas' hands, and would succeed in lowering prices as Shas did not. Former Foreign Minister Avigdor Lieberman needled Shas as well, stating that Likud Beytenu would take the Interior Ministry from the party and would do a better job.